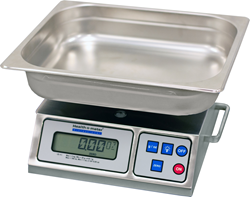 Pelstar LLC/Health o meter® Professional Scales develops stainless steel, high resolution scale with removable weighing surface. The scale’s refined 0.05 oz (1 g) resolution and 176 oz (5000 g) capacity provides highly precise and accurate results, ideal for the Operating Room or NICU. In addition to g/oz conversion, the scale’s Tare function easily deducts the weight of a diaper or container to provide the accurate net weight of the contents. The scale’s backlit display illuminates the weight reading for easy visibility in low light environments. The 3400KL is TAA compliant, backed by a comprehensive, hassle-free 2 year warranty and is eligible for ScaleSurance, Health o meter® Professional Scales’ Extended Warranty program. The Digital Wet Diaper/Lap Sponge/Organ Scale (Model 3400KL) is available for purchase through Health o meter® Professional Scales authorized distributors. For more information visit http://www.homscales.com or call 1-800-815-6615.